Haunt your way through your next costume party or Halloween celebration as the Headless Horseman. Washington Irving’s “The Legend of Sleepy Hollow” is the tale two men vying for the attention of a woman and a ghastly specter of a Hessian soldier that haunts the town. Make a Headless Horseman costume that would scare Ichabod Crane with cardboard and easy-to-find items. Break down the box so you have one large sheet of cardboard. Find a bowl or pot that fits on top of your head. Place the bowl upside down on the cardboard and trace around it with a pencil. Measure across the back of your shoulders. Draw a line on either side of the circle that’s the length of your measurement. Connect the sides. You will have a rectangle with a circle in the middle. Cut out the rectangle with a utility knife. Cut the circle from the rectangle. Draw an equilateral triangle with the same shoulder measurement that you used for the rectangle. Cut two of these out of the cardboard. Tape the triangles to the long sides of the rectangle. Measure 3 inches from the point of the triangle and snip off the end so the cardboard is now flat instead of pointed. Do this for both sides. Cut two rectangles out of the cardboard that are the size of a T-shirt sleeve. Round the edges of one short end on each of the pieces. Tape these small rectangles to the short sides of the piece you have put together. Leave a gap between the edges so the arms can move. Try on the piece to ensure that it fits over your head and lays flat on your chest and arms. Lay the piece flat on your work surface. Spray liquid foam on either side of the circle, the arm pieces, the chest and back. Use at least 6 inches of foam as you are trying to elevate the piece so the shoulders sit at your ears. Let the foam dry overnight. Shave bumps with a knife so the foam lays flatter against your body. Work the XXL turtleneck shirt over the chest piece. Try on the top and mark a spot to cut eye holes. Try to line it up so your holes can be slits in the seam where the turtleneck meets the shirt. Add a vest, shirt, pants and an ascot. 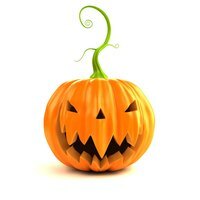 Carry a plastic jack-o-lantern as a prop. Wear glasses so the shirt doesn’t push against your face and eyes. Use caution when using a utility knife. Liquid foam can omit fumes, so use in a well-ventilated area.